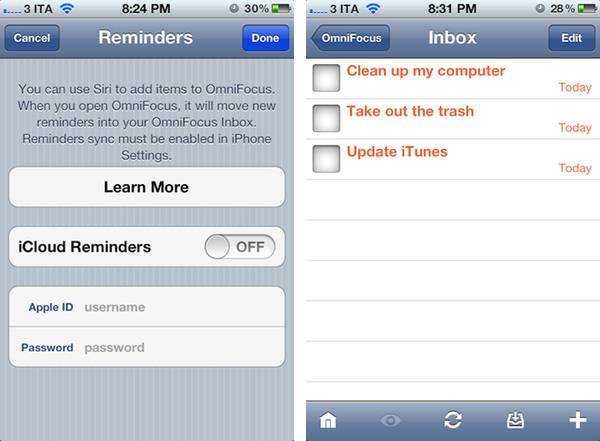 With the latest update to OmniFocus for iPhone, The Omni Group has figured out a way to let the app interact with iOS reminders and iCloud, and automatically fetch reminders created through the iPhone 4S' Siri or Reminders app. Whilst you still can't ask Siri to create new tasks directly into OmniFocus, the solution implemented by The Omni Group is very clever, and it gives you the illusion of native integration with the assistant, using iCloud and your Apple ID as a bridge between Siri's reminder functionality, and OmniFocus. The Omni Group has implemented a new feature called iCloud Capture that is capable of taking Reminders from your iCloud account, and move them into OmniFocus' inbox. iCloud Capture, as explained in the Help section, literally takes input that would otherwise stay into Reminders, and moves "as much data as it can" away from Reminders and into OmniFocus. 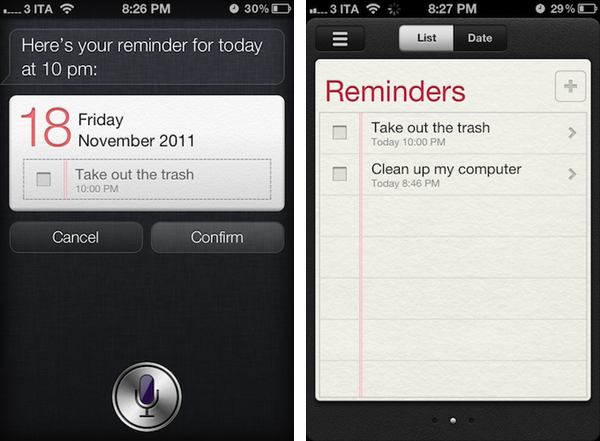 This is done in two ways: first, you have to create reminders that go into a "Reminders" or "OmniFocus" list. Second, you'll have to log in with your iCloud account in OmniFocus' settings, and enable iCloud Capture. Once enabled, OmniFocus will check for new reminders every time upon launch and move them into the inbox. The "upon launch" part is important, as OmniFocus can't process iCloud data in the background -- you won't be able to add reminders via Siri, and expect OmniFocus to import & sync in the background. You'll have to open OmniFocus for iCloud Capture to work, but it's a minimal effort compared to the added convenience of being able to let OmniFocus seamlessly process and import reminders. Please note that reminders will be deleted from Reminders.app as they're moved to OmniFocus; title and dates will be preserved in the transition, but The Omni Group says that location reminders -- which both Siri and Apple's Reminders can use out of the box -- will be "most effective" when they match Reminders' contact locations and OmniFocus' own implementation, which is quite different from Apple as it's got more options. From my understanding of this limitation, it appears getting location reminders into OmniFocus from iCloud might work best if OmniFocus is using the same contact information rather than its "current location" or "exact location", and I'll need to investigate this further. For now, I can say that one location-based reminder did go through iCloud Capture, but another did not, and stayed inside Reminders. The Omni Group didn't add direct Siri integration, but they came up with one of the most clever ways I've seen to use Siri and iCloud to create reminders and have them automatically moved to OmniFocus every time you open the app. The system isn't perfect, but has worked very well for me with simple reminders. Another good point of iCloud Capture is that Windows users will be able to move Outlook tasks to OmniFocus when they launch the app, as iCloud Capture checks for all reminders in your iCloud account, not just those created via Siri. Overall, I'd recommend giving iCloud Capture a try, and see if reminders might work better for you inside OmniFocus rather than Apple's Reminders. Update: The Omni Group has posted a series of videos showing how iCloud Capture works. Check them out after the break.